Nancy Paulsen Books, 9781524740740, 32pp. A confident little boy takes pride in his first day of kindergarten, by the Newbery Honor-winning author of Crown. The morning sun blares through your window like a million brass trumpets.It sits and shines behind your head--like a crown. Mommy says that today, you are going to be the King of Kindergarten! Starting kindergarten is a big milestone--and the hero of this story is ready to make his mark! He's dressed himself, eaten a pile of pancakes, and can't wait to be part of a whole new kingdom of kids. The day will be jam-packed, but he's up to the challenge, taking new experiences in stride with his infectious enthusiasm! And afterward, he can't wait to tell his proud parents all about his achievements--and then wake up to start another day. 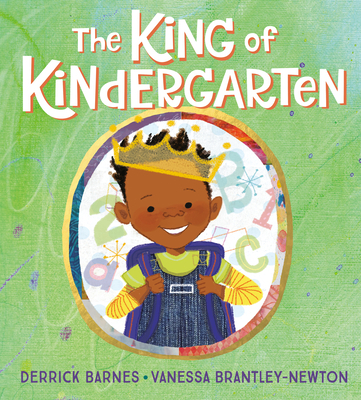 &nbsp;&nbsp;&nbsp;&nbsp; Newbery Honor-winning author Derrick Barnes's empowering story will give new kindergarteners a reassuring confidence boost, and Vanessa Brantley-Newton's illustrations exude joy. Derrick Barnes wrote the critically acclaimed picture book Crown: An Ode to the Fresh Cut, which received a Newbery Honor, a Coretta Scott King Honor, and the 2018 Ezra Jack Keats Award. He also wrote the bestselling chapter book series Ruby and the Booker Boys. He owns the copy-writing company Say Word Creative Communications and created the popular blog Raising the Mighty, where he "chronicles the experience of bringing up four beautiful Black boys in America." He lives in Charlotte, North Carolina, with his wife and their four sons. Vanessa Brantley-Newton has illustrated numerous picture books, including The Girl Who Heard Colors (by Marie Harris), Mary Had a Little Glam (by Tammi Sauer), One Love (by Cedella Marley), A Night Out with Mama (by Quvenzhané Wallis), and The Youngest Marcher (by Cynthia Levinson), as well as the chapter book series Ruby and the Booker Boys (by Derrick Barnes) and Jada Jones (by Kelly Starling Lyons). She wrote and illustrated Let Freedom Sing and Grandma's Purse. She lives in Charlotte, North Carolina.